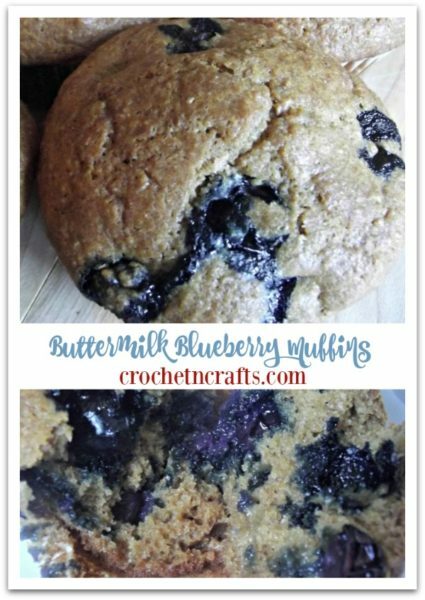 Everyone deserves a treat from time to time, and what better choice than these buttermilk blueberry muffins. Not only are they delicious, but healthy as well due to the natural sweeteners used to bake them. You can use any sweetener you like, but I chose a whole brown sugar and honey to obtain the perfect amount of sweetness that you could want in blueberry muffins. 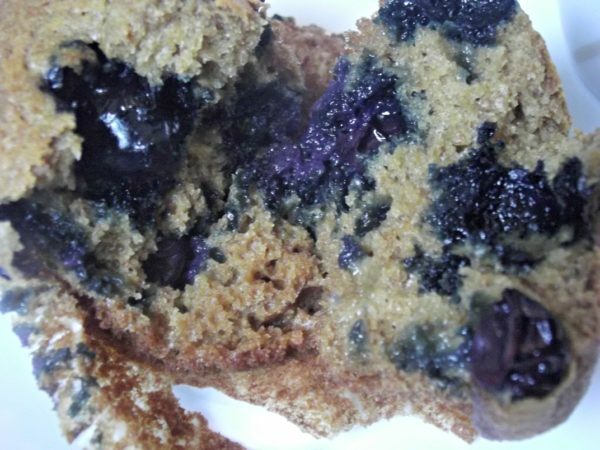 You can make these muffins year round, but they are always best in blueberry season. I find the bigger and juicier the berries, the more delicious the muffins. And, you can add less sugar if the blueberries are nice and sweet. Hot out of the oven with a glass of milk or a hot coffee is my favorite way to enjoy these. But you can also freeze them for about a month or two. They never last long in my freezer so I always make several batches whenever I make these. They are made 100% from scratch, so you know they are healthy. Or, healthier at least than anything you can buy at the store. These are not very sweet because I’m trying to avoid high amounts of sugar. But you can always add more if you have a sweet tooth. And as you can see, they are nice and moist when you break them open. Thus, they are perfect for parties, potlucks and other special events. 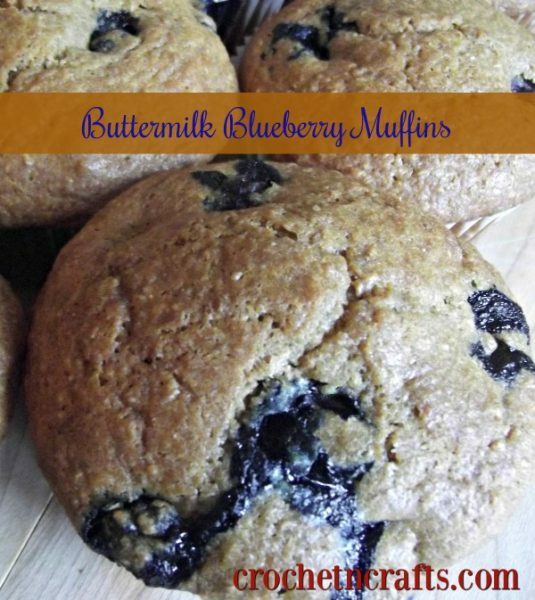 If you want them to look super appealing, you can add in an extra blueberry at the top of each muffin once all the batter has been divided. A tip for dividing the batter evenly is to add about 1 spoonful to each muffin cup. Then continue adding a bit more to each cup until the batter is divided. Whole brown sugar is also known as muscovado. It is made from cane juice and is very similar to regular brown sugar, except that it is healthier. It has a has a good amount of iron and other nutrients in it, so I felt good about putting that in. I did a search for it on Amazon and was unable to find it. 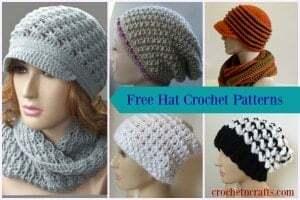 But here is a link to the product that I used. In a large bowl, combine dry ingredients except for sugar. Set aside. In a medium-sized bowl, whisk together sugar, butter, eggs, honey and vanilla. Add buttermilk and give another quick stir to combine. Add wet mixture to dry mixture and stir to combine. Add in blueberries. Spray a muffin tin or line it with muffin cups. Divide batter evenly among 12 muffin cups. Bake at 375 F for about 25 minutes until baked through and toothpick comes out clean. Serve warm with milk or your favorite tea or coffee. Eat within a few days, or freeze immediately for a month or two.